A New Mexico custom home builder selects optimal solution for Indoor Air Quality challenges. High performance home builders face several Indoor Air Quality challenges in the building process before, during, and after a home is constructed. Choosing a reliable ventilation solution is key for maximum efficiency. Panorama Homes, a custom green home builder in Albuquerque, New Mexico, wanted to install an effective system in several newly constructed single family homes. They felt it was crucial to select a competitive, high performing ventilation system and fan that could bring in enough fresh air to dilute harmful indoor pollutants and create an easier breathing environment for the families that were about to grow up and make memories in these new homes. Panasonic Eco Solutions’ Intelli-Balance 100 ERV was chosen to be the primary ventilation system in all new single-family homes. Carol Orona of Panorama Homes selected the system because of its overall efficiency and cost effectiveness, and technical features that provide builders with much needed flexibility, automatically adjusting to any home in any climate zone in North America. To address spot ventilation in the garage, the Panasonic WhisperGreen Select vent fan was installed to exhaust excessive pollutants caused by a sealed garage floor, the homeowner’s car collection, and materials stored there for the up keep of the automobiles. The fan’s ECM motor with intelligent self-adjusting SmartFlow™ technology senses the amount of resistance in the duct run and automatically adjusts the fan speed to deliver the optimal CFM output, even in the case of a complicated duct run. The installation and function of the ERV units and vent fans in the first set of newly built homes in the area have proven to be successful. 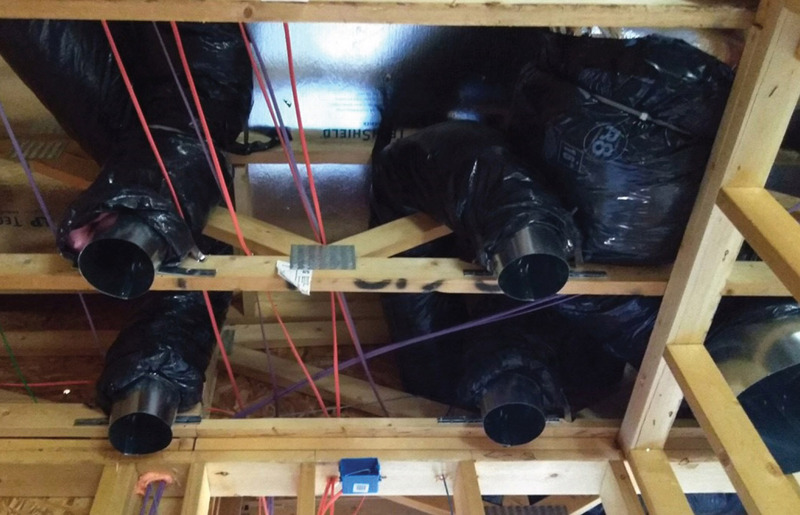 A certified Indoor Environmental Consultant performed measurements and demonstrated the effectiveness of both the Intelli-Balance system and the WhisperGreen Select fan on a new home’s IAQ. Air sample measurements of IAQ factors such as VOCs and humidity were collected 24 hours before and 24 hours after the units were installed. Overall results showed a 92% reduction in the total VOC. In the Spring of 2018 Panorama Homes received recognition from The Home Builders Association of Central New Mexico (HBA) with the Parade of Homes award in the ‘Most Innovative’ category. Learn more about fresh air ventilation calculations and HRV/ERV systems through the High Performance Mechanicals course offered by EEBA.